Detail of statue on W front. Floor plans: ground; first; second; third; fourth Preparatory drawing for 'Tolbooths and Town-Houses', RCAHMS, 1996. N.d.
Elevation Preparatory drawing for 'Tolbooths and Town-Houses', RCAHMS, 1996. N.d.
(NS 4030 6326). 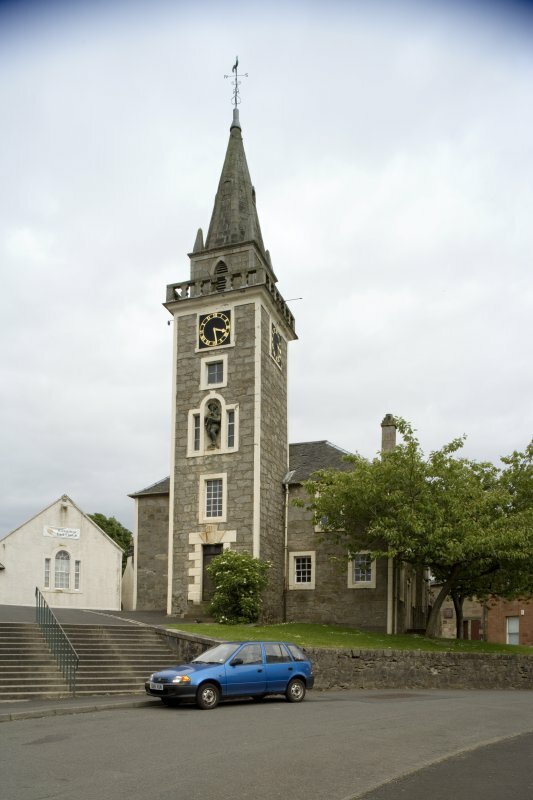 Kilbarchan Steeple and Steeple Buildings: Square clock-tower with an octagonal stone spire. Two-storeyed village hall (formerly school and meal-market) recently restored. Architect: David Kerr, Master Mason 1755. 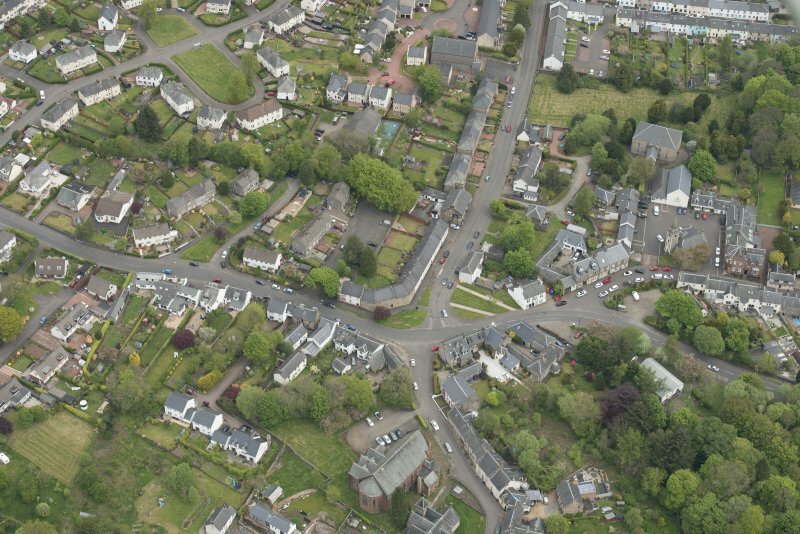 Photographic survey by the Scottish National Buildings Record/Ministry of Work in September 1957. 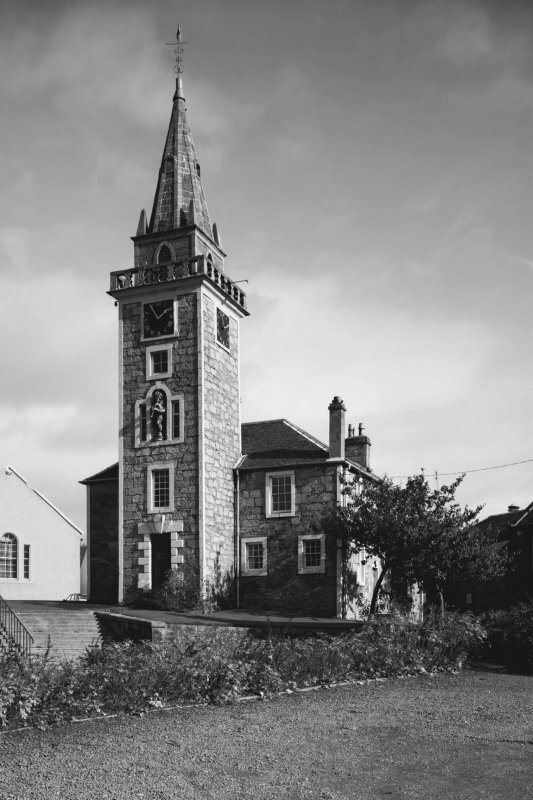 Situated on an elevated island site at the E end of Steeple Street, this building dominates the centre of the village. It is two-storeyed and rectangular on plan, measuring 13.8m from NW to SE by 11.8m, and an elaborate steeple, 3.7m square and 21m in overall height, is set against the NW front. 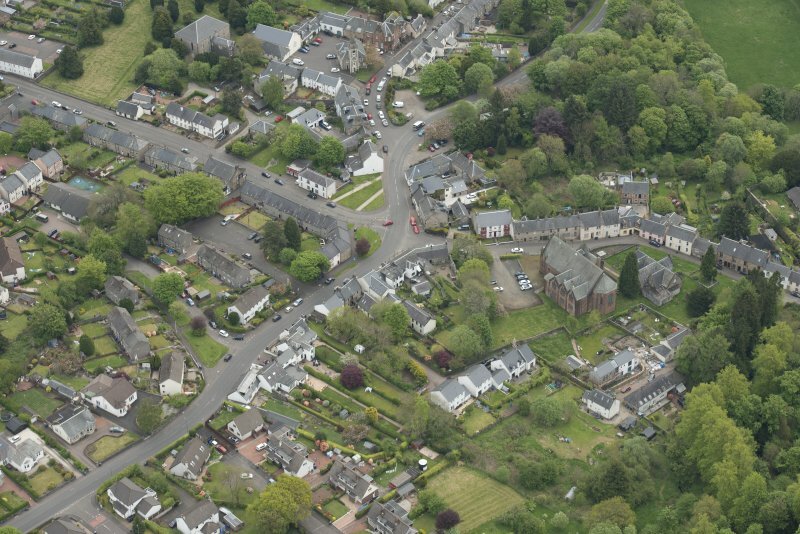 The main SW block, 7m in width, is hipped to the NW and gabled to the SE, with two hipped wings projecting to the NE and linked by modern infill. Both parts are built of roughly coursed sandstone rubble with dressed margins, but the steeple has an ashlar belfry and spire. The building originated about 1751 in a proposal to build a small parish school, to which the principal heritor, James Milliken of Milliken, suggested the addition of a steeple for the village bell and a room for a meal-market. 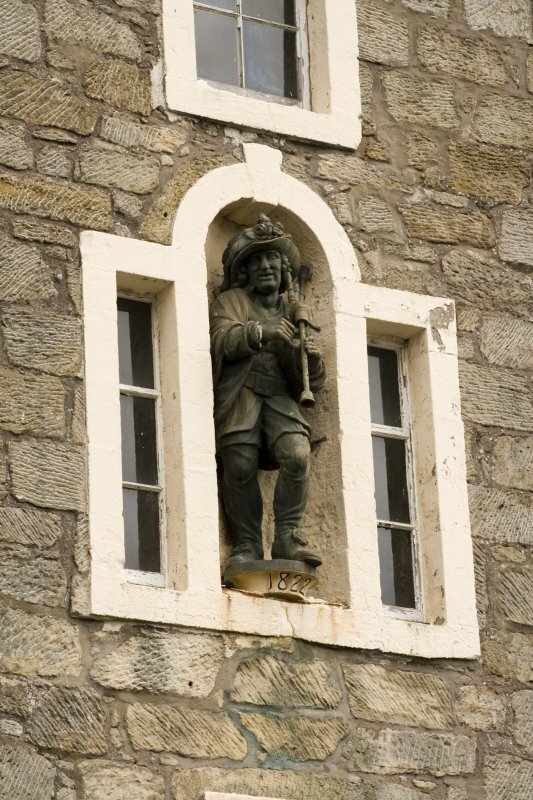 It was built in this form in 1755, probably by the local mason David Kerr, and Milliken at first retained the upper room in the NE wing, above the meal-market, but later resigned it to the kirk-session for the use of the local ladies, between church services and during hunt meetings. 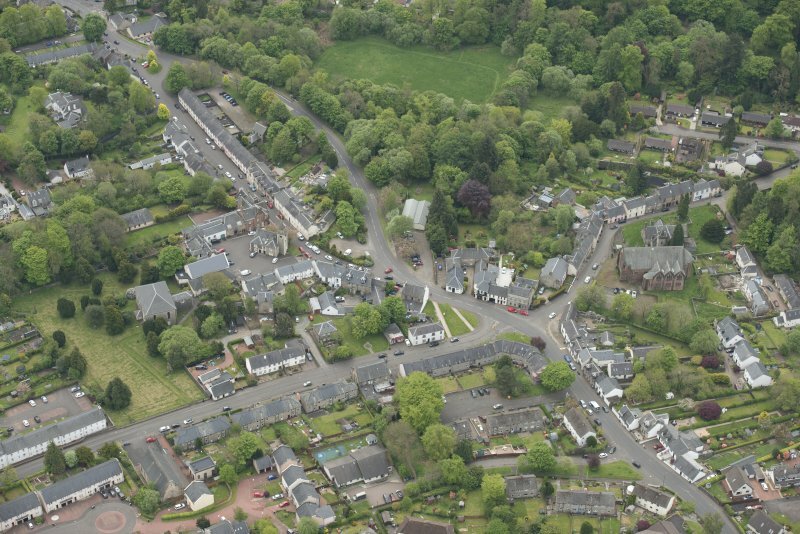 In 1782, however, the school was demolished at the insistence of the presbytery of Paisley, and enlarged to form the present main block, and then or soon afterwards the E wing was built as a strong-room serving the market, with a school room or dwelling above. 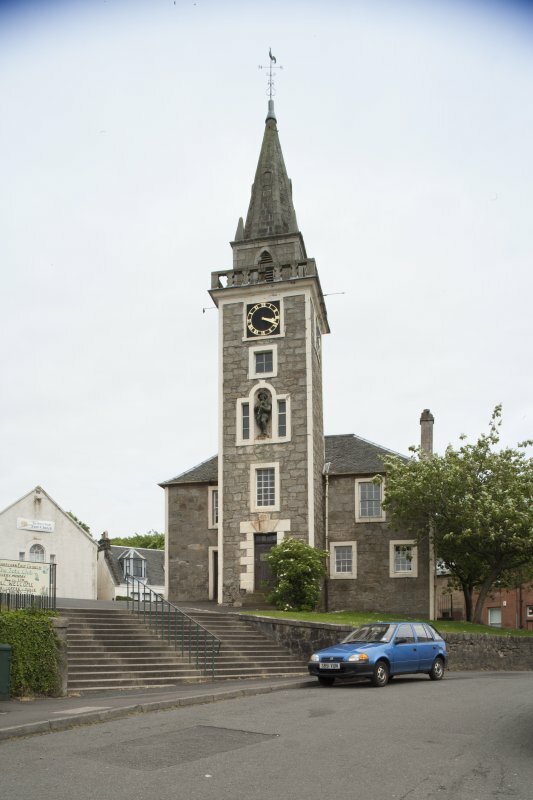 The steeple, which measures 3.7m square and is 21m high, is of six storeys. In its NW front there is a doorway with a Gibbs surround and an exaggerated keystone. 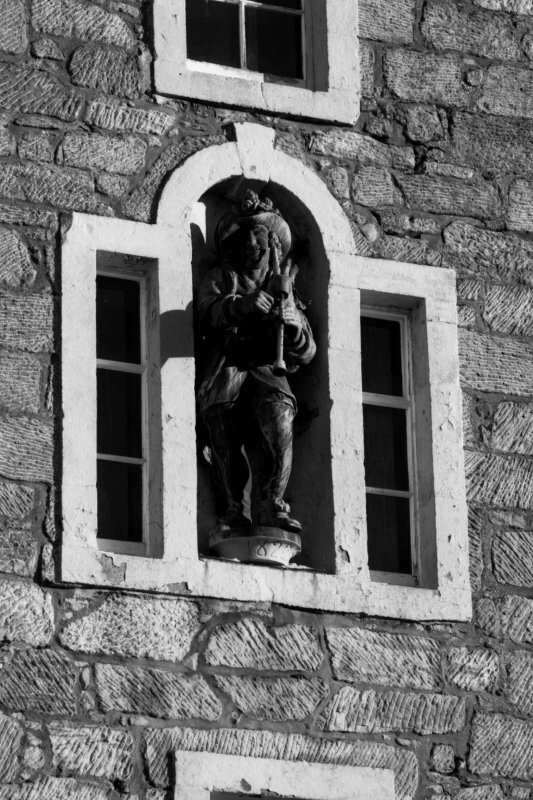 At the third stage there is a Venetian window with a central arched nichecontaining a statue of Habbie Simpson (c.1550-1620), a celebrated local piper. The present bronze figure, erected in 1932, is a replica of a wooden one installed in 1822, the date that is carved on the pedestal. At clock-level in each wall there is a painted clock-face in a square moulded surround. The balustrade of the parapet, which projects on a prominent moulded cornice, combines shaped stone balusters of flat section with plain angle-pillars and copings. 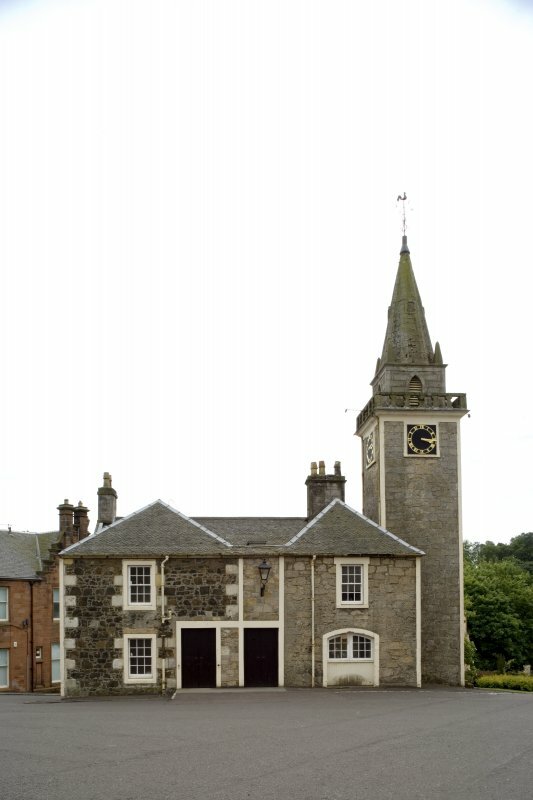 The belfry, which is stepped in from the lower stages, has a louvred lancetopening in each face and houses a bell cast by Thomas Mears of London in 1811. It is surmounted by an octagonal stone spire with ribbed angles, which has obelisks at the bases of the oblique faces. 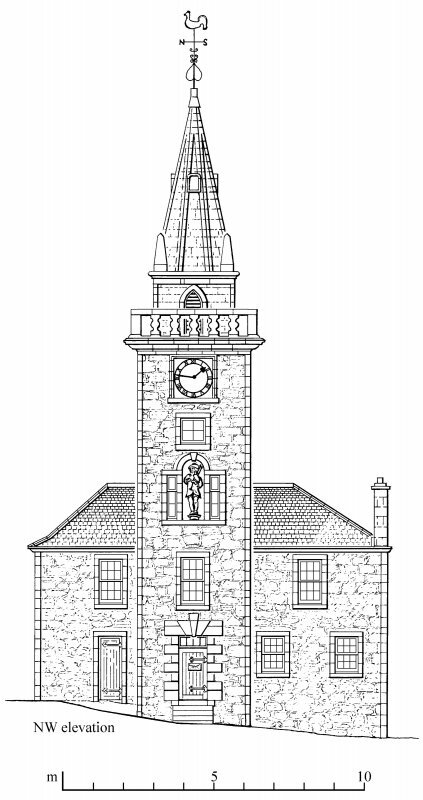 The original school of 1755, described as measuring 9.1m by 6.1m over all, probably occupied the site of the enlarged one and, with the NE wing, would have formed a symmetrical NW front having the steeple at the centre. The masonry of the existing main block suggests that its outer walls, induding the irregular NW front, were entirely rebuilt in 1782, and its internal dimensions of 12.2m by 5.5m correspond with those specified at that date. Its SW front is of three bays of windows at both levels, with a doorway NW of the central ground-floor window. A segmental-headed archway in the NE wall of the square NE wing of 1755 gave access to the meal market on the ground floor, where a fire-engine acquired in 1765 was housed for many years. The rectangular E wing is probably also of late 18th-century date, although its masonrydiffers from that of the 1782 block. The interior has been extensively altered, most recently in a major restoration of about 1955-8, and only the former 'Ladies' Room' on the first floor of the NE wing retains its original character. The interior walls of the steeple, which has a newel-less spiral stair housing the bell-rope, have also been altered, and it is not certain whether it provided access to the other parts of the building, although there is a blocked archway at first-floor level. A modern stair now occupies the area between the two wings, and the access to the 'Ladies' Room' was probably always in this position.